Farley was born on February 15, 1964, in Madison, Wisconsin and grew up in Maple Bluff. His father, Thomas John Farley Sr. (1936–1999), owned an oil company, and his mother, Mary Anne (née Crosby), was a homemaker. He had four siblings: Tom Jr., Kevin, John, and Barbara. His cousin, Jim, is Executive Vice President and President, Global Markets at Ford Motor Company. Farley's family is Roman Catholic and of Irish and Scottish descent. Farley attended Catholic schools in his hometown, including Edgewood High School of the Sacred Heart. According to Joel Murray, a fellow Second City cast member, Farley would "always make it to Mass." Many of his summers were spent as a camper and counselor at Red Arrow Camp, near Minocqua, Wisconsin. He graduated from Marquette University in 1986, with a concentration in communications and theater. At Marquette, he played rugby and discovered a love of comedy. After college, he worked with his father at the Scotch Oil Company in Madison. He got his start in professional comedy at the Ark Improv Theatre in Madison, and at the Improv Olympic theater in Chicago. He then performed at Chicago's Second City Theatre, starting the same day as Stephen Colbert, initially as part of Second City's touring group. He was eventually promoted to their Mainstage in 1989, and was a cast member of three revues: The Gods Must Be Lazy, It Was Thirty Years Ago Today, and Flag Smoking Permitted in Lobby Only or Censorama. Along with Chris Rock, Farley was one of the new Saturday Night Live cast members announced in the spring of 1990. On SNL, Farley frequently collaborated with fellow cast members Adam Sandler, Chris Rock, Tim Meadows, Rob Schneider, and David Spade, among others. This group came to be known as the "Bad Boys of SNL." Popular characters performed by Farley included Matt Foley, an over-the-top motivational speaker who constantly reminded other characters that he "lived in a van, down by the river." The name of the character was drawn from an actual friend of Farley who, during a troubled period, lived in a van near a river. The real Matt Foley later became a Catholic priest and appeared in the 2015 documentary I am Chris Farley. In late renditions of the character, Farley used other names, depending on whom he knew in the audience, until the real-life Foley went to the show and had his name used, at which point Farley felt the name best suited the character and refused to change it. Some of the mannerisms of the character were a combination of the positions Farley noticed his rugby teammates took on the pitch coupled with the voice his father used when he was angry. Other famous Farley characters included Todd O'Connor of Bill Swerski's Superfans, a group of stereotypical Chicagoans who constantly shouted "da Bears! "; a Chippendale's dancer, in a famous sketch that paired him with guest host Patrick Swayze; one of the "Gap Girls", who hung out together at a local mall; a stereotypical lunch lady, to the theme of Lunchlady Land performed by Adam Sandler; Bennett Brauer, a Weekend Update commentator who often divulged his personal and hygienic problems via air quotes; and himself on The Chris Farley Show, a talk show in which Farley quite often "interviewed" the guest, regularly getting very nervous. Some of these characters were brought to SNL from his days at Second City. Farley also performed impersonations of Tom Arnold (who gave Farley's eulogy at his private funeral), Andrew Giuliani, Jerry Garcia, Meat Loaf, Norman Schwarzkopf, Dom DeLuise, Roger Ebert, Carnie Wilson, Newt Gingrich, Mindy Cohn, Mama Cass, Hank Williams Jr., and Rush Limbaugh. Off screen, Farley was well known for his pranks in the offices of Saturday Night Live. Sandler and Farley would make late-night prank phone calls from the SNL offices in Rockefeller Center, with Sandler speaking in an old woman's voice and Farley farting into the phone and mooning cars from a limousine, and even once defecating out a window. He was also known to frequently get naked and do various stunts for laughs. Chris Rock once claimed that he probably saw Farley's private parts more than Farley's girlfriend did. Sandler told Conan O'Brien on The Tonight Show that NBC fired him and Farley from the show in 1995. During his time on SNL, Farley appeared in the comedy films Wayne's World, Coneheads, Airheads, and uncredited in Billy Madison. He also appeared in the Red Hot Chili Peppers music video for "Soul to Squeeze", which was a song featured on the Coneheads soundtrack. After Farley and most of his fellow cast members were released from their contracts at Saturday Night Live following the 1994–1995 season, Farley began focusing on his film career. His first two major films co starred his fellow SNL colleague and close friend David Spade. Together, the duo made the films Tommy Boy and Black Sheep. These were a success at the domestic box office, earning around $32 million each and gaining a large cult following on home video. The two films established Farley as a relatively bankable star and he was given the title role of Beverly Hills Ninja, which finished in first place at the box office on its opening weekend. Drug and alcohol abuse related problems interfered with Farley's film work at this time. Production of his final film, Almost Heroes, was held up several times so Farley could enter rehab. He was known among comedic contemporaries and friends to be sensitive about how his comedy was perceived, and was particularly hurt by harsh critical reactions to Tommy Boy, a film he enjoyed making. He was particularly dissatisfied with Black Sheep, an attempt by the studio to recapture the chemistry on Tommy Boy, and was only 60 pages into the script when the project was green lit. As a result, he relapsed on the night of the premiere, which required further rehab before he could begin work on Beverly Hills Ninja. After his death on December 18, 1997, his final completed films, Almost Heroes and Dirty Work, were released in the summer of 1998. Farley was originally cast as the voice of the title character in the movie Shrek, recording 85% (or 95%, according to some sources) of the character's dialogue, but died just before recording was finished. The filmmakers felt continuing the film with Farley would be in bad taste, so Shrek's dialogue was re-recorded by former SNL castmate Mike Myers. A story reel featuring a sample of Farley as Shrek was released officially in 2015. The original version of Shrek was more like Farley himself, according to his brother. Farley was slated for another voice role in Dinosaur as a young male brachiosaurus named Sorbus who, despite his gigantic stature, was frightened of heights. After his death, the character was rewritten as Baylene, an elderly female Brachiosaurus played by British actress Joan Plowright. At the time of his death, Farley had been in talks to costar with Vince Vaughn in The Gelfin, and to star in a biographical film about comedian Fatty Arbuckle. Jim Carrey's role in the 1996 film The Cable Guy was originally intended for Farley, but scheduling conflicts forced him to decline. Farley was slated to appear in a third Ghostbusters film, which was at the time intended to be about a new trio of Ghostbusters taking on overpopulation in Hell. Dav Pilkey, author of the children's book series Captain Underpants, had wanted Farley to play the title role in a potential television series based on the books, but discarded the idea after Farley's death. Farley had been in talks for the lead in an adaptation of the novel A Confederacy of Dunces. Farley even expressed interest in portraying Atuk in an adaptation of the novel The Incomparable Atuk. Both of these shelved projects, along with the Arbuckle biopic, have been alleged to be cursed as Farley, John Belushi, and John Candy were each attached to all three roles, and all three died before any of the films entered production. Rumors are that originally, Adam Sandler had written Grown Ups in the mid 1990s, with Farley in mind for the role of Kevin James' character, Eric Lamonsoff. In fact, it is said that had Farley lived, he very likely would've done most of the roles which James received. Farley and his good friend David Spade were in talks on making a film based on his Matt Foley character. These plans were put to a halt, due to Farley's death on December 18, 1997. For much of his life he struggled with alcohol and illicit drug abuse; such addictions caused him to be suspended repeatedly from the cast of Saturday Night Live. Bernie Brillstein, who personally managed John Belushi and whose firm Brillstein-Grey Entertainment managed Farley, repeatedly sent Farley to drug and alcohol rehabilitation. Following his final guest appearance on SNL on October 25, 1997, there was a visible decline in Farley's health. Farley's hoarse voice and flushed skin were the subject of public scrutiny. In the final years of his life, Farley had sought treatment for obesity and drug abuse on 17 occasions. On December 18, 1997, Farley was found dead by his younger brother, John, in his apartment in the John Hancock Center in Chicago. He was 33 years old. An autopsy revealed that Farley had died of an overdose of cocaine and morphine, a combination called speedball. Advanced atherosclerosis was cited as a "significant contributing factor." Farley's death has been compared to that of his SNL idol John Belushi, who died at the same age of a similar combination of drugs. A private funeral was held for Farley on December 23, 1997, at Our Lady Queen of Peace Catholic Church in his hometown of Madison, Wisconsin. Over 500 people attended this funeral, including many comedians who had worked with him on Saturday Night Live and on film, such as Dan Aykroyd and Adam Sandler; notably absent was Farley's best friend David Spade, who chose not to attend the funeral, stating years later that he had found it emotionally hard to handle Farley's sudden death. Farley's remains were entombed at Resurrection Cemetery. On August 26, 2005, Farley was posthumously awarded the 2,289th star on the Hollywood Walk of Fame, located in front of iO West. An authorized biography of Farley, The Chris Farley Show, was written by his brother Tom Jr. and Tanner Colby. The song "Purple Stain" from the Red Hot Chili Peppers' 1999 album, Californication, contains the lyric "Farley is an angel and I can prove this" as a tribute to Farley. A television documentary on Farley's life, I Am Chris Farley, was shown on August 10, 2015. Farley was also the subject of the TV program, Autopsy: The Last Hours of Chris Farley, which premiered on November 19, 2016 on the Reelz channel. In 2018, Adam Sandler wrote and performed an emotional tribute song dedicated to Farley in his 2018 Netflix stand-up special “Adam Sandler: 100% Fresh". Netflix would later upload the tribute song to YouTube on the 21st anniversary of Farley's death. ^ "Chicago Alumni". The Second City. Retrieved 2010-10-25. ^ a b c "Chris Farley Biography — Yahoo! Movies". Movies.yahoo.com. Retrieved 2010-10-25. ^ a b "Wisconsin Historical Society". Wisconsinhistory.org. Retrieved 2010-10-25. ^ The Chris Farley Tour of Madison, Wisconsin | The Bozho Retrieved 2018-09-20. ^ Vlasic, Bill (April 20, 2008). "A Star at Toyota, a Believer at Ford". The New York Times. New York City: New York Times Company. p. 4. Retrieved June 8, 2008. ^ "Chris Farley". The Chris Farley Show. Archived from the original on April 24, 2009. Retrieved September 4, 2011. ^ "Marquette University — Famous Faces". Marquette.edu. February 12, 2003. Archived from the original on January 4, 2013. Retrieved October 25, 2010. ^ Engel, Tom (March 17, 2009). "Tom Farley addresses brother's addictions". Marquette Tribune. Retrieved October 3, 2016. ^ "Chris Farley Biography". The Biography Channel. Retrieved October 25, 2010. ^ "Chris Farley". The Second City. Retrieved December 18, 2017. ^ "The Bad Boys of Saturday Night Live (1998) (TV)". IMDb.com. Retrieved June 28, 2016. ^ Anderson, Sam (May 16, 2008). "Dada's Boy". New York. New York City: New York Media. Retrieved June 8, 2008. ^ "New Exhibit: Chris Farley Remembered". Wisconsin Historical Society. Retrieved June 8, 2008. ^ a b Goldblatt, Henry (May 7, 2008). "'Chris Farley Show' stuffed with gossip". Atlanta, Georgia: CNN. Retrieved June 8, 2008. ^ Crawford, Bill (2000). Adam Sandler: America's Comedian. New York City: Macmillan. p. 75. ISBN 0-312-26282-5. ^ "Chris Farley's Black Sheep Jacket". wisconsinhistory.org. Retrieved 2008-06-07. ^ Smith, Chris (1995-03-15). "Comedy Isn't Funny". New York. p. 7. Retrieved 2008-06-08. ^ "You're not alone, Conan O'Brien: Adam Sandler says NBC fired him and Chris Farley from 'SNL'" Joe Dziemianowicz, Daily News (New York), January 21, 2010. ^ Hlavaty, Craig (2012-02-17). "10 Things That the Wayne's World Movies Gave Us". Houston Press. Retrieved 2016-09-25. ^ Howe, Desson (1993-07-23). "Coneheads". The Washington Post. Retrieved 2016-09-25. ^ Maslin, Janet (1994-08-05). "FILM REVIEW; 'Airheads.' Yes, Indeed. That and Even Less". The New York Times. Retrieved 2016-09-25. ^ "Billy Madison". TV Guide. Retrieved 2016-09-25. ^ Spanos, Brittany (2016-06-22). "Readers' Poll: The 10 Best Red Hot Chili Peppers Music Videos". Rolling Stone. Retrieved 2016-09-25. ^ "Box Office Mojo data for ''Black Sheep''". Boxofficemojo.com. 1996-03-15. Retrieved 2010-10-25. ^ "Box Office Mojo data for ''Tommy Boy''". Boxofficemojo.com. 1995-05-16. Retrieved 2010-10-25. ^ "Box Office Mojo data for Beverly Hills Ninja". Boxofficemojo.com. 1997-01-17. Retrieved 2010-10-25. ^ a b Tucker, Reed (2007-12-16). "That Was Awesome!". New York Post. Retrieved 2008-06-07. ^ Berkowitz, Joe (2015-08-06). "Chris Farley Was Originally The Voice of Shrek–And Footage Has Finally Surfaced". Fast Company. Retrieved 2019-02-21. ^ "Hear What a Chris Farley Shrek Would Have Sounded Like in 1997". /Film. 2015-08-06. Retrieved 2019-02-21. ^ Griggs, Brandon. "Hear Chris Farley's Shrek in newly unearthed clip". CNN. Retrieved August 10, 2015. ^ Plolowy, Kevin. "Chris Farley's Original 'Shrek' Was 'Humble, Bumbling, Innocent', According to Brother". Retrieved May 29, 2016. ^ Parks, Zack (September 28, 2012). "Top 10 Actors Who Almost Voiced Disney Animated Characters". Retrieved July 25, 2015. ^ Rabin, Nathan (June 9, 2009). "Fatty fall down, make tragedy: The Chris Farley Show". The A.V. Club. Retrieved July 31, 2015. ^ a b c Evans, Bradford (December 6, 2012). "The Lost Roles of Chris Farley". Splitsider. Retrieved August 9, 2015. ^ Ditzian, Eric (March 27, 2009). "Original 'Ghostbusters' Cast Onboard For Reboot, Harold Ramis Says". MTV News. Retrieved August 9, 2015. ^ Heller, Karen (April 26, 2000). "His Books Let Him Stay Class Clown, Even At 34". Philly.com. Retrieved August 9, 2015. ^ Hyman, Peter (December 14, 2006). "A Conspiracy of Dunces: Will John Kennedy Toole's comic masterpiece ever reach the big screen?". Slate. Retrieved 25 July 2015. ^ Raouf, Neda (February 21, 1999). "The 'Atuk' Curse". Los Angeles Times. Retrieved August 6, 2015. ^ Evans, Bradford (March 3, 2011). "The Lost Roles of John Belushi". Splitsider. Retrieved August 12, 2015. ^ Mills, Steve (January 3, 1998). "Drug overdose killed comedian Farley". Chicago Tribune. Chicago, Illinois: Tronc. Retrieved July 3, 2018. ^ Shales, Tom; Miller, James Andrew (2003). Live from New York: An Uncensored History of Saturday Night Live. New York City: Back Bay. pp. 492–93. ISBN 0-316-73565-5. ^ Nashawaty, Chris (January 9, 1998). "The Last Temptation of Chris". Entertainment Weekly. New York City: Meredith Corporation. Retrieved June 7, 2008. ^ Sutton, Larry; Domiguez, Robert; Hervieux, Linda; Sweeney, Michael (December 16, 2015). "Chris Farley, actor and comedian, dies at 33 in 1997". New York Daily News. New York City: Tronc. Retrieved July 3, 2018. ^ a b c "Chris Farley's Death Laid to Drug Overdose". The New York Times. New York City: New York Times Company. January 3, 1998. Retrieved June 7, 2008. ^ Thelmer, Sharon (December 18, 1997). "Fellow comedians weep for Chris Farley". Athens Daily News. Athens, Georgia: Gatehouse Media. Archived from the original on August 18, 2009. Retrieved October 25, 2010. ^ Ryan, Joal (December 23, 1997). "Farley funeral: The Day the Clowns Cried". eonline.com. Retrieved March 31, 2013. ^ Grow, Kory (April 30, 2014). "David Spade Explains Why He Didn't Attend Chris Farley's Funeral". Rolling Stone. New York City: Wenner Media Ltd. Retrieved July 3, 2018. ^ "Find A Grave - Chris Farley". Retrieved December 19, 2018. 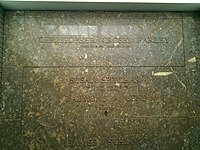 ^ "Chris Farley Gets Posthumous Star". usatoday30.usatoday.com. Retrieved February 7, 2017. ^ "Chris Farley". IMDb. Retrieved 2017-08-08. ^ "Chris Farley". 4-traders.com. Retrieved 2016-06-28. an agreement with the Estate of Chris Farley under which Network (Entertainment) will develop and produce a feature documentary on the life and legacy of legendary funny man Chris Farley. We very much look forward to working with Kevin and the rest of the Farley family to recount Chris' life and work, and the impact he had on all those around him, in an authentic, moving, and of course very funny, way. ^ "Autopsy". now.reelz.com. Retrieved 2017-07-26. ^ "Adam Sandler's Netflix stand-up special '100% Fresh' is his best work in years". USA TODAY. Retrieved 2018-11-05. ^ Farley, Tom; Colby, Tanner (2006). The Chris Farley Show: A Biography in Three Acts. Viking Adult. p. 337. ISBN 1-616-80458-0. ^ Kronke, David (June 15, 1998). "Macdonald's 'Dirty Work' Needs a Laugh Transplant". Los Angeles Times. Retrieved August 2, 2012.